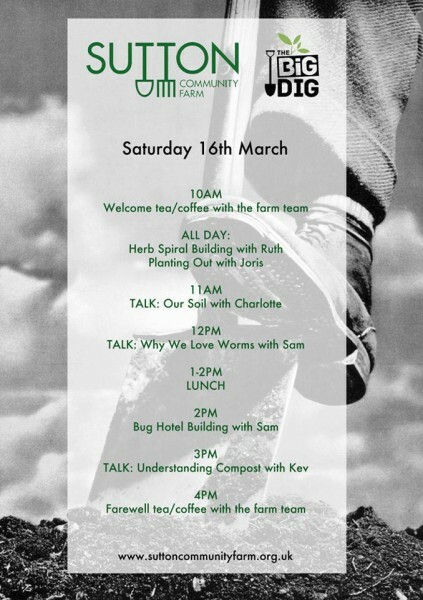 A short note to say thank you to everyone that came down to the Farm on Saturday for The Big Dig. What a wonderful day! Despite a rainy morning, we had a fantastic turn out and achieved so much. In the morning we sowed over 1,000 seeds and planted out lots of salad. Charlotte gave a talk about the importance of soil, including a look into the type of soil we have on the farm. Sam told us stories about worms, and had us digging into the compost heap collecting worms for a new compost bin. Then after a delicious homemade soup, we headed out for more planting in the afternoon followed by a practical composting session with Kev. Head to our Facebook page to see photos from the day.